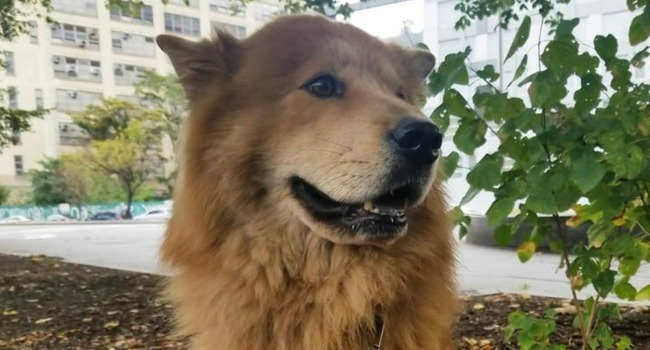 It was a harrowing seven hours for Gwen Wunderlich, whose Chow mix, Cash, had quite the adventure traipsing around Brooklyn and Manhattan. 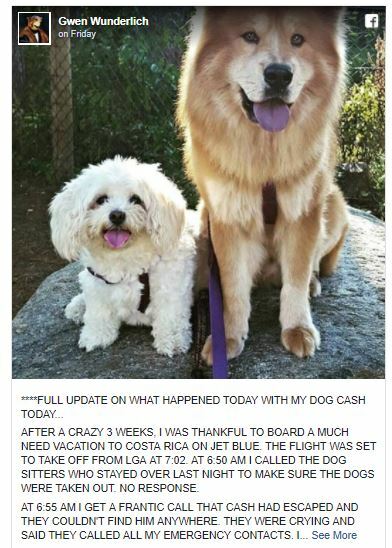 Imagine that you’re set to fly off on a sorely needed dream vacation, literally sitting in the plane waiting to taxi, and you get a frantic call from your dog walker saying your pup had slipped the leash and run off…. Into New York City traffic, no less! This was the nightmare that Brooklyn resident Gwen Wunderlich recently lived out. She notified the attendant on her JetBlue flight to Costa Rica that she would have to exit the plane. She had adopted Cash, a Chow mix, six years ago. TThe dog walked had tearfully shared that he’d gotten away near the Brooklyn Bridge and was headed in the direction of Manhattan. She wasn’t leaving town without knowing he was safe and turned to the police — and social media — for help. Police told her he’d been spotted in the bridge traffic and before long she was getting calls about sightings in Lower Manhattan. “We drove to Canal Street, we drove to the Manhattan Bridge, Brooklyn Bridge, back downtown by Canal Street,” Wunderlick told CBS. The it seemed that Cash was on the East Side. She was getting regular updates from friends on the lookout around the city. Many strangers had seen him, too. Seven grueling hours passed. Then Wunderlich got a call from Animal Control. Cash had apparently walked into a deli and planted himself behind the counter. Police were called and he and his mistress were joyfully reunited at Animal Control not long after. Cash did not have a microchip, but Wunderlich took care of that immediately. She recounted the saga in a Facebook post. We’re so glad this one has a happy ending…and we hope Gwen makes it to Costa Rica soon! How Many Dogs Do You Want?